Adelaide has recently experienced heavy rain and flooding, with more wet weather forecasted this week. High water levels in the River Torrens have damaged bridges in the local area. If you travel on Kelly Road which crosses Valley View and Modbury (near the North East Road turnoff) be grateful that you don’t have to travel over this old wreck of a bridge. Probably built for a horse and cart to cross, it looks so old that it was and it could have had a troll living under it. 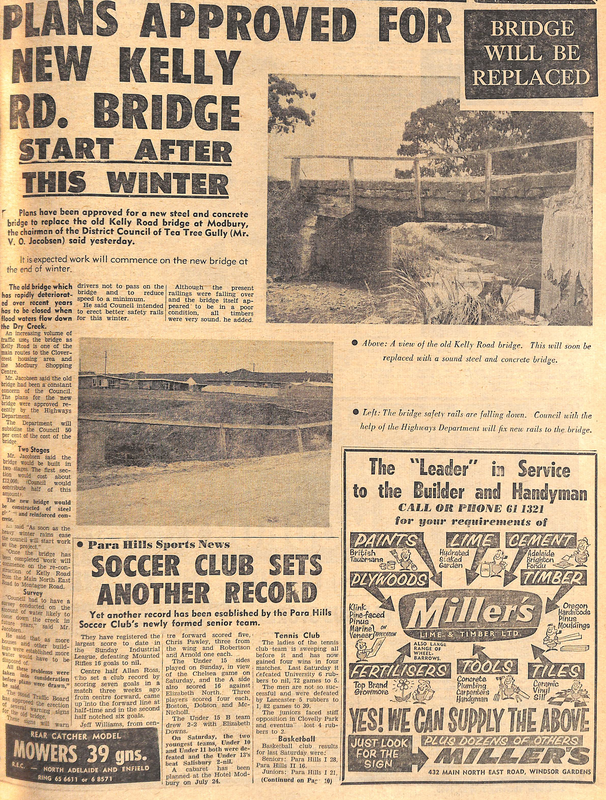 On page 1 of the North East Leader Messenger on 27 May, 1965 the newspaper reported that in the Spring, the District Council of Tea Tree Gully was set to replace the stone bridge which crosses a section of Dry Creek, with a solid structure made of steel and reinforced concrete. The bridge’s safety rails were falling down and drivers were advised not to travel over it or to reduce speed when doing so. Councillor V.O. Jacobsen, Chairman of the Council told the reporter that despite the safety rails falling over and the apparent poor condition of the bridge, all the timbers were in sound condition. If you cared to take the chance! Let’s hope that the bridge actually lasted the Winter of 1965 without any casualties incurred crossing it. Driving over this section of Kelly road in 2016, you may not even notice that you have actually crossed a bridge. This entry was posted in history and tagged waybackwhenwednesdays by adrienne12. Bookmark the permalink.